As part of my job, I’m often cooking all sorts of things that I would never normally make at home. Usually it’s to demonstrate to my students some principle of food preparation or a particular skill that they need to know. Occasionally I will take some of my creations home for my kids, but usually my students are more than happy to ‘sample’ my demonstration. 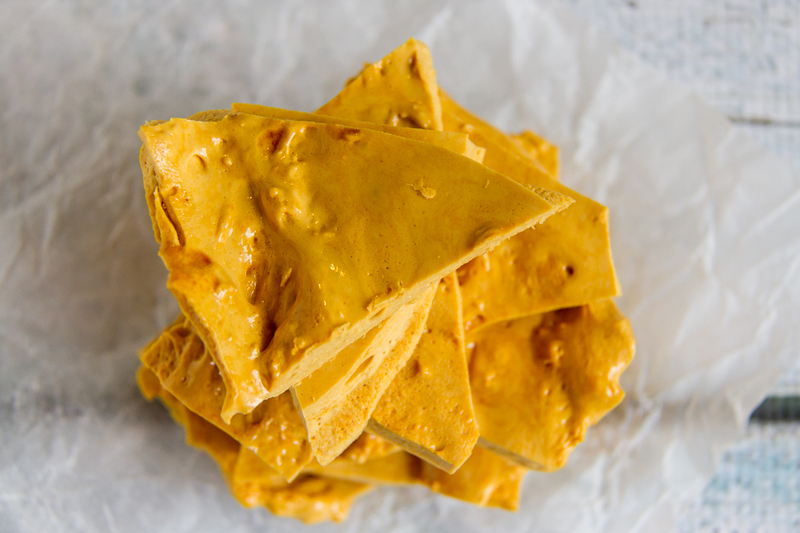 One food item I make every few years is honeycomb (for those who are interested, it demonstrates chemical raising agents beautifully). Each time I make it, my students are always eager to try it (no surprises there), so it never gets home to my own kids. Earlier this year, Hannah and I were having a discussion about how cooking food is really just a giant science experiment (aren’t I just the coolest mum ever! 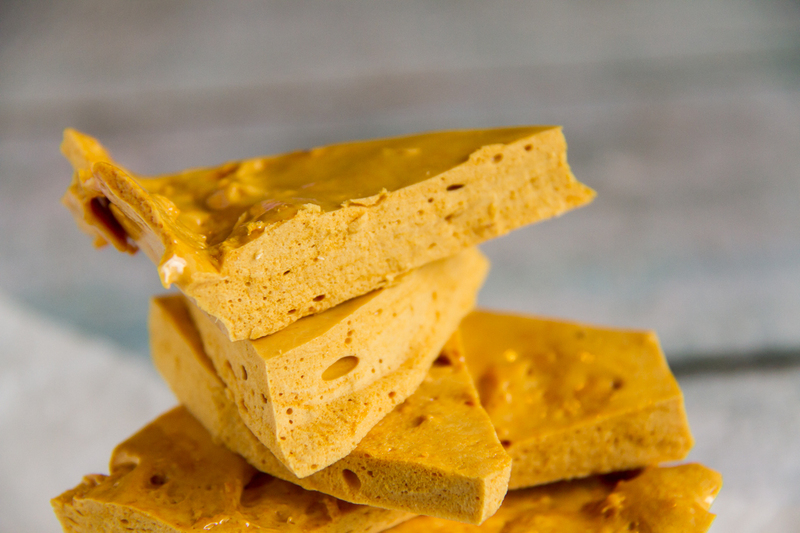 ), and I mentioned that honeycomb was a fun, easy thing to make. Of course she then suggested (OK insisted) that we make some. Since then she has mentioned making it several time – usually just as she is going to bed – and we agree that we should make it one time. Over the weekend, with the rainy weather promising to keep the kids indoors for the entire time, I thought it would be a good idea to trot out the honeycomb as an activity we could do. It does require a bit of patience to get the sugar mixture up to the right temperature, but once it’s there, the bicarb soda works it’s magic, and suddenly you have honey comb. Place the sugar, honey, water, and golden syrup in a saucepan. Slowly heat the ingredients, allowing the sugar to dissolve. Brush the sides of the saucepan with a little water, using a pastry brush, to dissolve any sugar crystals on the side of the pan. Bring the mixture up to a simmer, and simmer until the sugar mixture reaches 154*c. Stir occasionally. If you don't have a sugar thermometer, you can test the temperature by dropping a little of the sugar mixture into a cup of cold water. The mixture will be a dark colour and will be crunchy like toffee - with no chewiness. Once the the mixture reaches 154*c, remove from the heat, and allow to sit until there are no bubbles in the mixture. Quickly stir in the bicarb soda. This will cause the mixture to bubble into a creamy mass. Working quickly, pour the mixture onto a tray lined with baking paper and allow to cool. Once the mixture is cool, snap it into pieces. Store in an airtight container. Do not refridgerate. In Australia we have two chocolate bars with honeycomb centres: the Crunchie, and the Violet Crumble. Most people prefer one over the other. Wars have been fought over lesser issues than which one is better. For the record, I prefer the Crunchie. Are you a Crunchie or Violet Crumble person? Are you a cool parent like me? 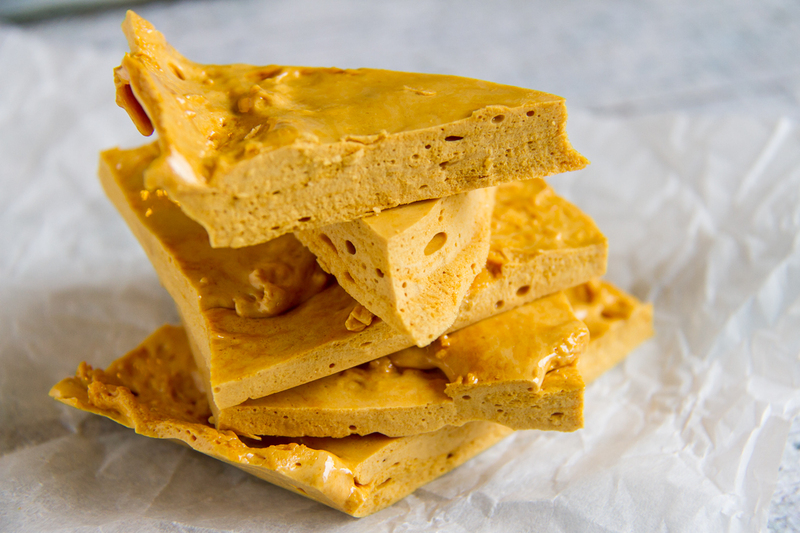 Have you made honeycomb before? Violet crumble bar definitely. 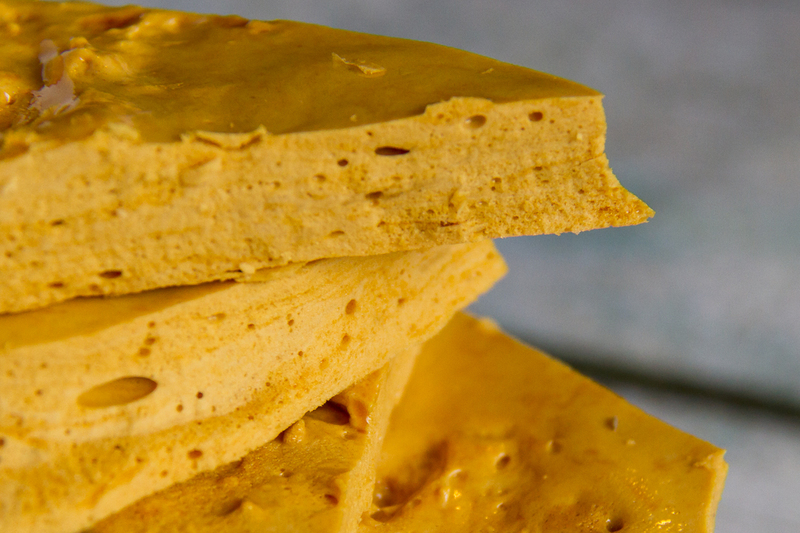 However, some honeycomb is better than no honeycomb. I almost never eat sweet things or even high carb stuff, these days. I have been known to buy a bag of honecomb pieces dipped in cheap chocolate when desperate. Have not tasted any for a couple of years now.